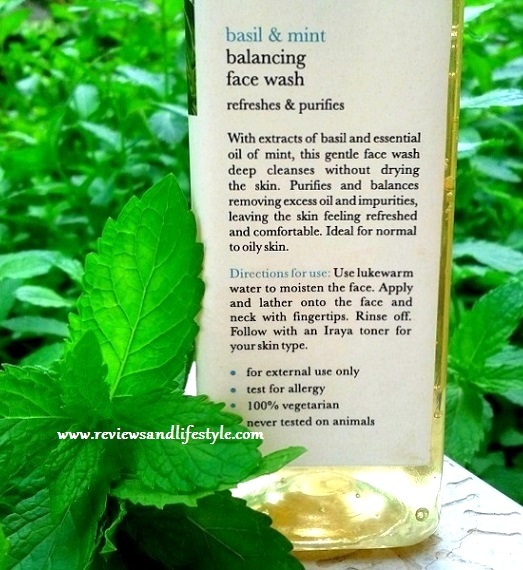 This is a review of Iraya basil and mint balancing face wash for normal to oily skin. In Summers, our skin produces more sebum, so even dry skin goes normal. Therefore, this face wash would suit dry skinned people too in summers. It contains extracts of basil and mint essential oil, which clarify, soothe and tone the skin. Balancing means something that creates a balance of natural oil in facial skin, by cleaning only the extra oil and not ripping the skin of too much oil and moisture. Availability: You can buy from: Flipkart.com, Jabong.com, Joybynature.com or from Iraya stores in major cities. For discount, it is best to buy from Jabong.com as they offer 30-45% discount over weekends on a certain min purchase value, which includes beauty and skin care products too. There are sometimes good offers on purplle.com and nykaa.com too. Most Iraya products come in either glass tubs or square plastic pump bottles with proper lamination. Pump is lockable but not travel friendly. 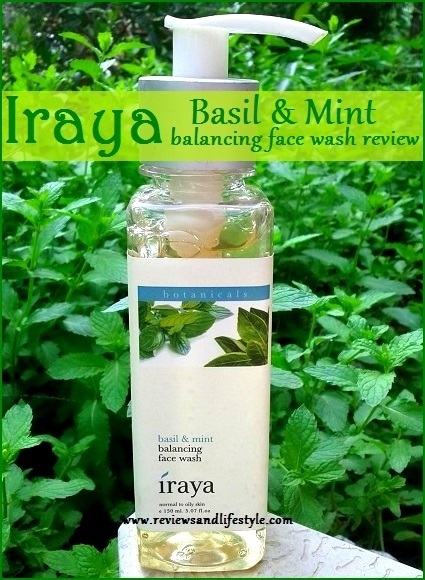 Iraya basil and mint balancing face wash claims to deep clean without drying, purify and balance the skin by removing excess oil and impurities, leaving the skin refreshed and comfortable. This face wash does everything that it claims. Basil soothes and purifies the skin. Is an astringent. 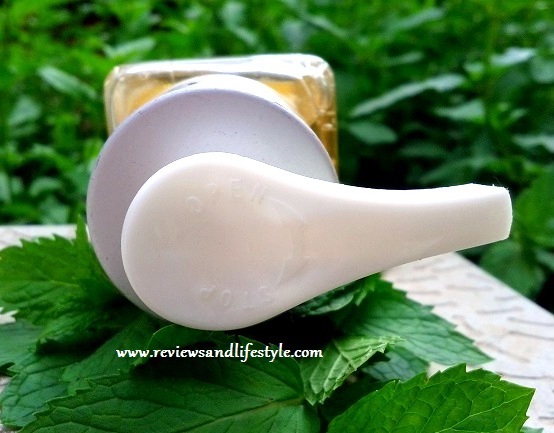 Mint refreshes skin and is again an astringent. So both of these tighten remove excess oil and tighten skin pores. Sodium Laureth Sulphate (SLES/Sodium Coco Sulphate) and Cocobutaine act as cleansers/surfactants. These are derived from coconut oil. 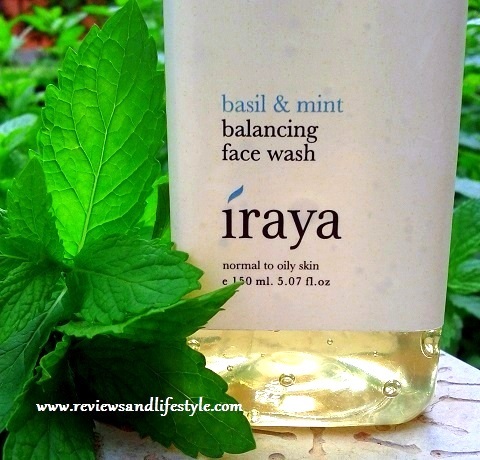 Iraya basil and mint balancing face wash is a light golden thick gel. I think the color comes from the acacia gum (kikkar/babool gond), which is also the gel base for this face wash. You can see small air bubbles trapped in the gel. It cleanses all dirt, grime and summer sweat stickiness effectively. Leaves a cool refreshing feeling and skin immediately feels soothed. I notice a glow after using it. It truly balances my oily t-zone and dry to normal facial skin. After trying the exotic Iraya Wildflower Nourishing Body Lotion, I had very high expectations of this face wash. But I didn't like it initially. One, it dried my face and two, it had a strong smell like men's cologne. 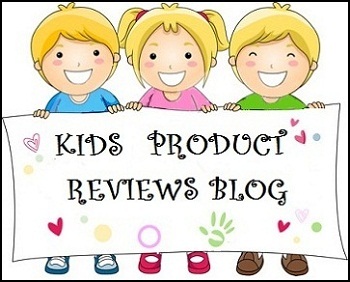 I checked a few reviews and they all mentioned that Iraya face washes are a bit drying and leave skin stretchy. However, the truth is this face wash started balancing my facial oil right from the 4th use. Post 3 uses, my skin adjusted to it and there is no dryness at all. I DON'T need a moisturizer post using this face wash, at least not in the present weather. I think I can use it up to Nov, after which the weather turns really cold and drying here. It is performing better with every use and perfect for this humid weather. It works great in removing makeup traces after you clean waterproof or oil based makeup with a makeup remover. The cologne like fragrance is very strong initially for a few days and later tones down. After washing the face, the fragrance stays for around 1 hour, but it tones down considerably by then. You need only one small drop to clean the face and neck. One bottle will last me 2 summer seasons using once daily. Leaves skin completely clean and glowing. Balances both my oily t-zone and normal to dry facial skin. Does not enhance skin pores or leave a shiny nose. I currently don't need a moisturizer after using this. Does not foam or lather at all. Is gentle. 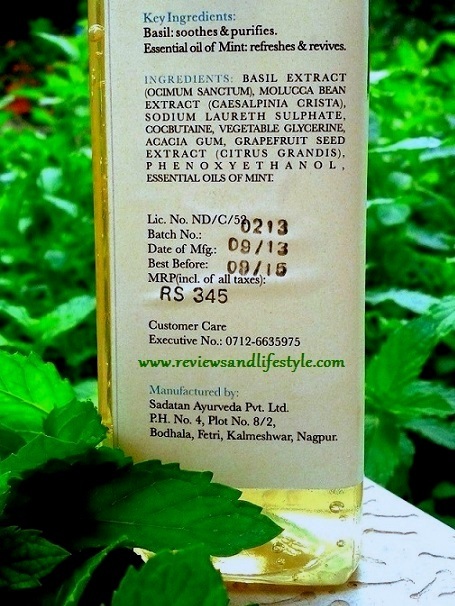 The sodium laureth sulphate is derived from coconut oil and is not chemical based. Works really good post makeup removal, especially helpful in removing left over traces of waterproof or oil-based makeup. On really humid days, it beautifully refreshes my sticky, oily, itchy skin without even a hint of dryness. If it happens to get into the eyes, it pains a little, may be due to the mint oil. Quantity is way too much. And although it is good value for money, I think both the quantity and the price should be less, so people don't get bored of using it for so long. Fragrance is pleasant and bearable, but is artificial and some people may not like it. People who like foaming face washes may not like it as it does not lather at all. 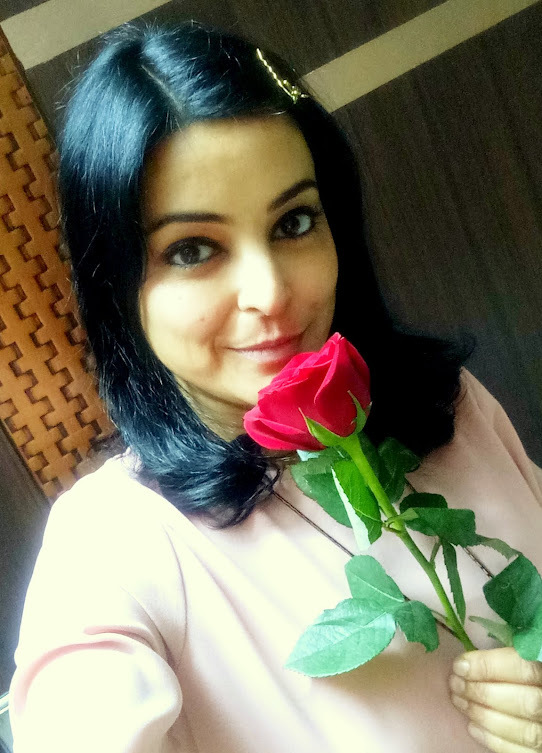 I discovered that even my mildest skin care products failed in Gurgaon climate though they suit me well in Punjab. Considering that, this may be drying in certain climatic conditions like places where skin always feels weepy and stretchy. I was about to give it away to someone but now I am loving that it is working for me. Overall, it is a very good product esp for oily skinned people and total value for money. it looks so soothing but i dont like face washes that require a lot of work! True Megha, nobody wants facewashes that leave a soapy feeling behind and take a lot to get rinse off. But this one does not require any rubbing at all. I dash water on my face 5-6 times and hold my palms against my face when I do so and it gets washed off easily without any need to rub. Nice product from Iraya. I shall give it a try in summer. Thanks Fatima, it is indeed nice and if you have normal to oily skin, you can use it in winters too. Thanks Supriya :) Yeah, I was about to give up on it too soon and jst the 4th time and the results changed so considerably. I am still using it and not a hint of dryness. Rather it is very mild on my oily t-zone.